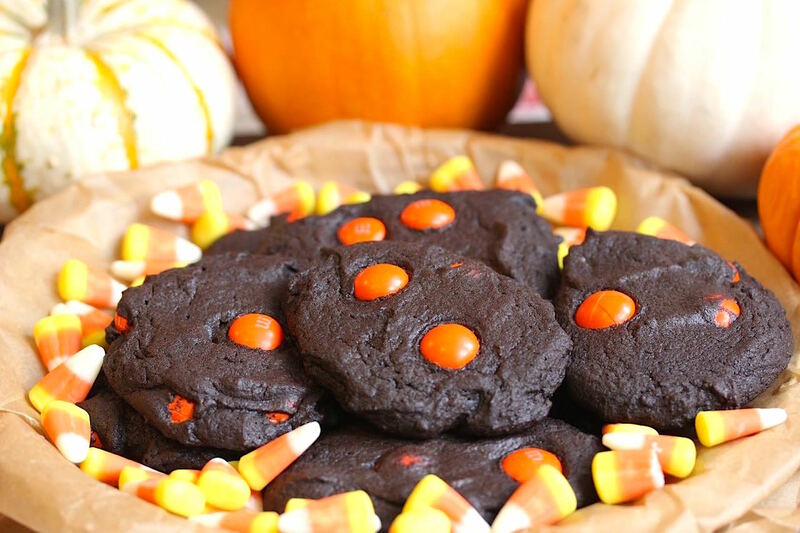 Double Chocolate Creepy Cookies…Happy Halloween!!! The idea of these cookies came up while I was watching with my four years old daughter the movie “E.T.”. I didn’t remember how sweet and creepy E.T. was so I decided to bake something alien-like for Halloween 2014. 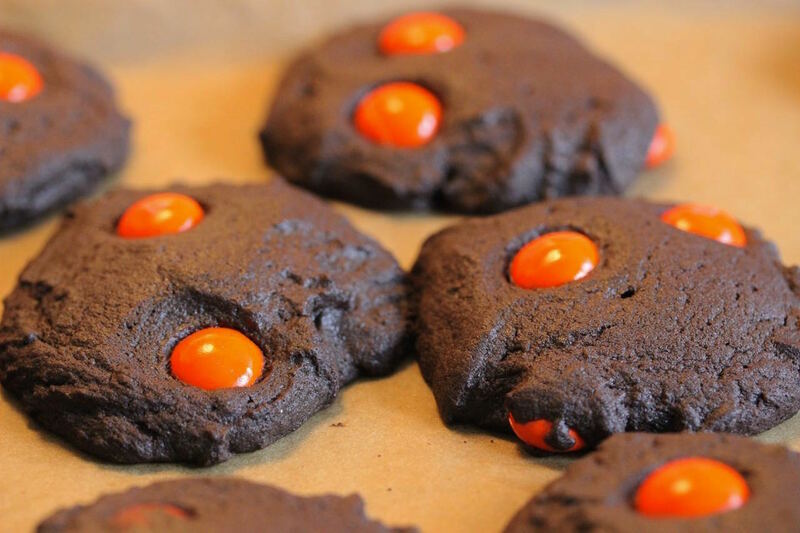 I just added to my favorite double chocolate chip cookies recipe M & M’s white chocolate candy corn candies instead of semi-sweet chocolate chips, then I put two orange candies over each cookie to create alien eyes. These cookies are soft, rich and amazingly chocolatey. I baked 12 of them and they were gone in no time. Cook Time : 10/12 min. – Sift together flour, cocoa powder, baking powder and salt. Set aside. – With a hand or stand mixer, cream butter and sugar until creamy. – Mix in the egg then the vanilla until combined. – Slowly incorporate the dry ingredients into the wet ingredients. – Stir in the M & M’s candy corn candies. – Scoop 1 tablespoon slightly rounded of dough for each cookie on a parchment-lined baking sheet. 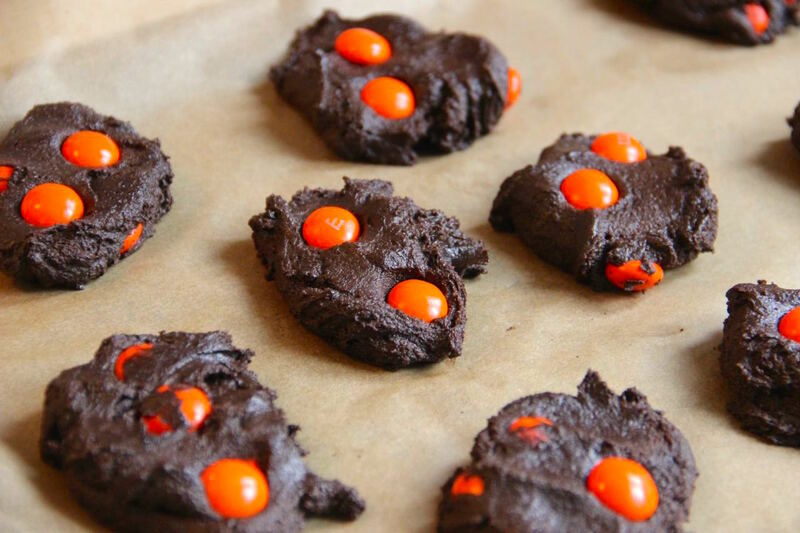 Decorate each cookie with 2 orange M & M’s candy corn candies. – Allow to cool on the baking sheet for a couple of minutes than transfer to a wire rack to cool completely.